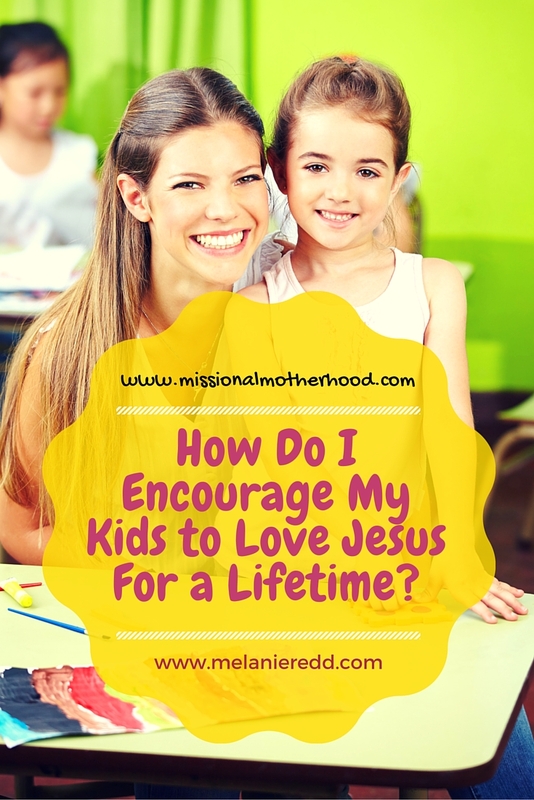 How Do I Encourage My Kids to Love Jesus For a Lifetime? Side by side, my 20-year old daughter and I entered the large doors of our former church, the place where she had been dedicated as a baby. As we looked around the foyer, we saw many familiar faces waiting to go into the service. Then, she quickly went back to her little huddle of friends. Another long-time friend entered the foyer and caught sight of my daughter. This friend made a bee-line for my Emily and swooped her up in a huge hug. When my friend finally released her from the embrace, she told her how beautiful she looked. Then, they talked for about 10 minutes. After the service as we were driving away, my daughter mentioned how much she had appreciated the kindness of my friend who had hugged her and been interested in her life. As I thought about the way both of my friends had responded, I realized that there was quite a contrast. The first friend had not connected with her or tried to engage her in much of a conversation at all. The second friend had blown her away with kindness, affection and genuine interest in her life. Both of my friends are godly women who love Jesus and their families; however, only the second friend really made a genuine effort to connect with my daughter. I am so grateful for this second friend. ~ Why am I bringing this up? ~ Why does this matter so much? Very simply: We are losing an entire generation of kids–ages 13-35. They are the millennials. They are the largest generation at over 65 million. And, according to Barna.org, 52% of them are completely unchurched! You can read more in an article I wrote about this generation HERE. So, How Do You Encourage Your Kids to Love Jesus For a Lifetime? Today, I’d like to propose four ways. Even if your children are babies, you can start practicing these things right now. It is never too early! Grandparents, parents, aunt, uncles, and Sunday school teachers can all put these actions to work! First:. We encourage our kids to fall in love with Jesus by being in love with Him ourselves! Although this may sound too simple, it’s a proven fact that we cannot take people where we are not going ourselves. Our children and grandchildren are looking to us to see if our God is real and if He is making a difference in our lives. They don’t need to see perfection or pretense. They need to see parents and grandparents who have personally met the Person of Jesus Christ and been radically impacted by this meeting! Our kids need to see that our faith is genuine and authentic. Second:. We encourage our kids to fall and stay in love with Jesus by loving them and building meaningful relationships with them and their friends. They don’t want a program or a plan; they want to connect with adults who will take a genuine interest in their lives. It looks like real life, real relationship, and real concern. Millennials want for us to reach out to them and connect with them. They want to come to our houses. They want to meet us for coffee and lunch. They want to be a part of our lives. They want to know us and see how we are relating to our spouses, kids, and grandkids. How do you do this – in very practical ways? When you are checking out at a store or being served by one of these kids – engage them in conversation, treat them with kindness, and tip them well. Look them in the eye and talk to them. Listen to them as they speak. As you are walking on the treadmill next to theirs or sitting next to them in class or at a meeting, reach out and try to make a friend. Just talk to them and get to know them. Love them like they were you own. Hug them even if they go “stiff as a board” on you. Tell them you care about them and love them. Ask them how they are doing, and listen to their responses. Treat them like you would want other adults to treat your kids and grandkids! Talk to your children over meals and while driving. Get to know them and show an interest in their lives. Ask them questions and listen to them as they share. Don’t lecture them or try to demand that they love the Lord. This generation hates lectures more than any before them! Slowly, patiently, gently love them into a relationship with Christ (or back into one). Third: We encourage our kids to fall and stay in love with Jesus by helping them to discover and use their gifts to serve the Kingdom. This process has been called “reverse mentoring,” and it stands as the third way to get our kids back into the fellowship. To reverse mentor is to give someone younger to chance to lead while that person is under your care. Our kids today want to be given opportunities to discover their gifts, use their gifts, and serve in and through the church. Even little children can be given these chances to serve, lead, and use their gifts. You can read this entire post HERE. Finally: We encourage our kids to fall and stay in love with Jesus by prayer, prayer, and more prayer. There is no simple solution to fixing the problem of kids walking away from the church and from the Lord; however, we can begin to plug the leak. We can slow the avalanche of kids leaving the church by engaging those in our circles of influence. We can save some by really seeking to befriend them and build meaningful relationships with them. We can also ask God to send some men and women into the lives of our own children who will impact them for eternity! You can read more about adding prayer to your home HERE. May that be true of us! May we be women praying passionately for our children and grandchildren to love the Lord! Melanie’s passion is to offer HOPE! She wrote curriculum for Lifeway for over 10 years before launching her own writing and speaking ministry.